Madrid's three main football teams are Real Madrid, Atlético de Madrid and Rayo Vallecano. Getafe is a city in the Madrid Metropolitan area and is therefore also included here. When Real Madrid and Atlético coincide in the first division, the Spanish Footbal League normally ensures that they play at home on alternate weekends. Whilst the majority of games are played on Saturday or Sunday, matches are often scheduled at other times such as Monday to allow teams to prepare mid-week European fixtures, or to allow for televised games. Occasionally, league games are also played mid-week. Information about how to obtain tickets to the games may be found below. 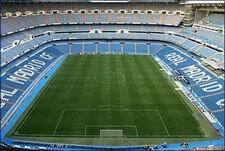 Real Madrid, officially the best football team of the 20th Century as recognised by FIFA, play at the famous Santiago Bernabéu stadium located near the Paseo de Castellana in Calle Concha Espina, s/n, 28026 Madrid (Metro: Santiago Bernabéu, Line 10). 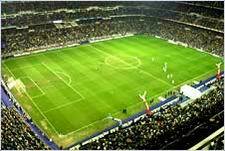 The Bernabéu Stadium has capacity for around 80,400 seated spectators and was built in 1947. Visits to the stadium and the Trophy Room (Sala de Trofeos) are possible every day except Chistmas Day and New Year's day from 10.30 a.m. - 6.30 p.m (except match days). Tickets for this stadium tour may be obtained here. Or, you can check out the Madrid City Pass for a "skip-the-line" ticket to the Real Madrid Stadium Tour together with many other Madrid attractions and special tours. Please see our special page about how to obtain tickets for Real Madrid. Or perhaps you would like information on how to buy tickets for possibly the best football match of the season: Real Madrid vs Futbol Club Barcelona! The official Real Madrid site is at http://www.RealMadrid.com. The club has a general information telephone number: (+34) 902-291-709. Atlético's stadium is the Wanda Metropolitano, inaugurated on 6th September 1994 and located Avenida de Luis Aragones, 4, 28022 Madrid (Metro: Estadio Metropolitano, Line 7). The stadium seats over 65,000 spectators. It is possible to take a tour of the stadium by clicking here. Tickets to Atlético de Madrid games can be bought at the stadium ticket offices or online tickets may be purchased here. Rayo Vallecano play at the Teresa Rivero stadium inaugurated in 1976 and located at Calle Payaso Fofó s/n, 28018 Madrid (Metro: Portazgo, Line 1). The stadium has a capacity of just over 15,000 seats. Tickets to games may be obtained at the stadium ticket offices between 5.30 p.m. and 8.30 p.m. and normally go on sale one week before each game. 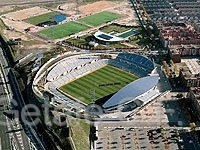 Getafe Club de Futbol play at the Coliseum Alfonso Perez stadium, inaugurated in 1998 and located at Avenida Teresa de Calcuta S/N 28903 Getafe, Madrid (Metro: Getafe Central, Line 12). The stadium has a capacity of just over 17,000 seats. Tickets to games may be obtained at the stadium ticket offices between 9:30am and 1:30am, and also 5:00pm a 8:30pm except on Saturdays. On match days, tickets may also be obtained from 11am up until the end of the first half. Finally, if you are also travelling to Barcelona, you may find our information on how to obtain Barcelona Football Tickets of use.